It took me a couple of weeks to finally paint in all the corners I needed to repost John Reilly's review of St. Teresa's The Interior Castle. Sure, I could have just slapped it up here, but I like to preserve the web of links John made within all of his works. It produces something like a wiki-walk. Maybe when I'm done with the reposting project I will do a network analysis of John's HTML files and see how it matches up with my own impressions. The reason I wanted to return to John's luminous review of St. Teresa's signature work is that I was struck by the similarities in Scott Alexander's book review of Mastering the Core Teachings of the Buddha. I have fond memories of Theravada Buddhism from my college years. I won a writing award in college for an essay, "Inescapable Beliefs," which dealt with my fascination with Buddhism, and my conviction that it could never replace Christianity in my heart. That particular bit of juvenilia should probably stay right where it is, but I look back on it now as a turning point in my life. My later college obsession with Japanese culture provided an introduction to Mahayana Buddhism that only reinforced my Chestertonian impression that Christianity speaks best to the universal human longing for God that is expressed in multitudinous ways. Which brings me to the contrast between The Interior Castle and Mastering the Core Teachings of the Buddha. There is a science of mystical experience. The Interior Castle is one of the key sources of its data; so are Teresa's earlier works, including the Life and The Way of Perfection. Even a cursory familiarity with the literature of mysticism will find resonances in this work. This reviewer was surprised to discover how much of this book's advice about prayer and the dangers of the advanced spiritual life is echoed in C.S. Lewis's most popular work, The Screwtape Letters. Lewis was familiar with the literature of mysticism, of course, but that is unlikely to be the whole explanation. Serious spirituality is an empirical enterprise; people who have experienced its effects will recognize them in the accounts of others who have experienced them. The kinds of experiences described by mystics seem to be somewhat independent of their cultural context. This implies a common psychological/neurological framework within which they occur. I can see a plausible argument to be made that this explains religion. I think it to be false, but I can at least see where people are coming from. Following Chesterton, and St. Thomas, I see this is evidence that we are are all looking for something that we lack, something that transcends our human particularities, a something best found in Christianity. Part of what makes me think so is the different impressions I get from St. Teresa's book on mystical experiences, and Ingram's. My impressions here are colored by what I learned about Theravada Buddhism in college, so I would be interested to hear otherwise. We should note that nowhere does Teresa suggest that the contemplative path is necessary for salvation, or even peculiarly helpful for it. Ordinary sanctity is something quite different in Christianity from the ultimate goal in Buddhism. It is far easier to achieve, and accessible to humbler people. 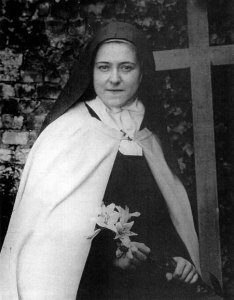 This perhaps is why Thérèse of Lisieux, sometimes referred to as St. Thérèse the Little Flower, a nun of the same order as her namesake, is so popular. The heroic spirituality of Teresa of Avila is out of the reach of ordinary people. The severe discipline described by Ingram seems similar. The Little Flower shows us another way. I sometimes describe myself as religious, but not not spiritual. Reading these parallel book reviews reinforces this in me. The way in which "enlightenment" overlaps with ordinary mental illness is particularly intriguing. Both Ingram and St. Teresa describe things that seem very much like common mental problems, and Alexander is particularly good at identifying these things. It isn't at all clear that the enlightenment Ingram describes is actually desirable. St. Teresa at least does a better job of selling it. However, each path is frankly described in terms that make it seem more than a little crazy. Furthermore, the things Alexander describes as in his book review as things to be overcome via meditation seem more like features than bugs to me. Taken seriously, it suggests that some of the most fundamental factors of our experience are not real features of the sensory world, but very strong assumptions to which we fit sense-data in order to make sense of them. And Ingram’s theory of vipassana meditation looks a lot like concentrating really hard on our actual sense-data to try to disentangle them from the assumptions that make them cohere. In the same way that our priors “snap” phrases like “PARIS IN THE THE SPRINGTIME” to a more coherent picture with only one “the”, or “snap” our saccade-jolted and blind-spot-filled visual world into a reasonable image, maybe they snap all of this vibrating and arising and passing away into something that looks like a permanent stable image of the world. In particular, I've never understood the obsession with the saccade among rationalists. This is clearly a feature of our brains that enables sense perception to better match reality than the unfiltered optic nerve data would be be. If you break it, you wouldn't be able to function well, which seems to be what happens if you go too far down the meditation rabbit-hole. The lesson I took from this is that the spiritual life is not for everyone, and can have some strongly negative consequences for the unwary. Religion, on the other hand, is accessible to everyone. I'll stick with religious, but not spiritual.